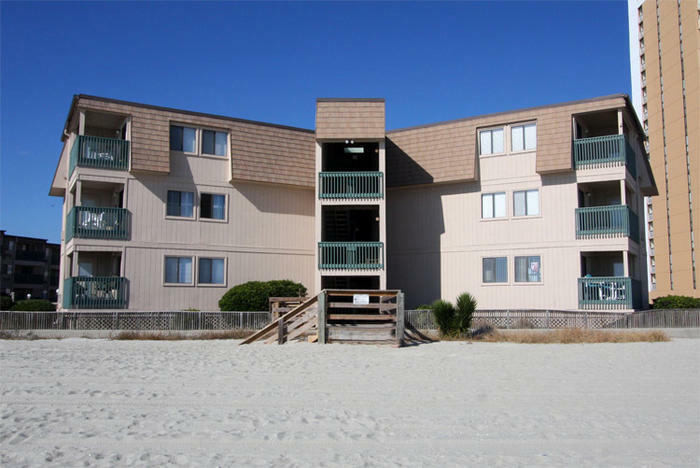 The beach vacation rental condos at A Place at the Beach III Resort in North Myrtle Beach, South Carolina, are thoughtfully fitted with a washer and dryer, and they include wireless Internet and flat-screen televisions for your convenience and entertainment. Dripping with amenities and endless fun, your resort condo serves as a launching pad for all your beach vacation dreams. From your oceanfront balcony, savor breathtaking sunrises. In the evening, take lingering strolls on the beach as you gaze at the moon and its ocean trail. A Place at the Beach III Resort is a place to relax, to rejuvenate the soul, to relish each tasty bite of oceanfront life. Whether you choose to enjoy glimmering views of the ocean and wide, white sandy beaches from the soothing waters of the resort pool, or from the shoreline itself, you will certainly find yourself unwinding from the stresses of the everyday. You and your friends and family can extend your North Myrtle Beach outdoor living time into mealtimes when you take advantage of the centrally located barbecue area at A Place at the Beach III Resort. This is outfitted with tables and grills. The area is lighted, so you can enjoy grilling your fresh seafood catches at the end of the day! Lounge around your cozy condo and spend quality downtime with family and friends, laughing together and making memories. Challenge your group to beach games down at the shoreline. A simple beach ball can evolve into an intense volleyball match in the sand. Be creative and play beach tic-tac-toe, using as markers found objects like seashells. Start up a relay race, play musical beach towels, or build a sandman, grateful to be miles away from the nearest snowflake! Write messages in the sand and photograph them for keepsakes. The best thing about North Myrtle Beach, South Carolina, is fun in the sun and sand with loved ones! Splash around in the ocean waves or dive in a little deeper by trying out some fun water sports. Stand-up paddle boarding has gained a lot of popularity in recent years, and for good reason. Not only is it a fabulous full-body workout, it is incredibly fun in the most addictive way! A myriad of boat rentals abound in North Myrtle Beach, which provides a great opportunity to take your group out for ocean adventures. If you would prefer someone else to do the steering, there are plenty of boat tours and cruises. For an incredible experience of a lifetime, taking a dolphin sightseeing cruise is a spectacular option. The nearby Sea Screamer and Sea Thunder cruises guarantee dolphin sightings! For a tour by land, Carolina Safari Jeep Tours offers a fascinating peek into the beautifully authentic South Carolina Lowcountry, delving into native wildlife, ecosystems, l00 year old ricefields, and pirate islands. It also travels by ricefields, plantations, and slave cabins. A Place at the Beach III Resort is delightfully close to restaurants, shopping, and entertainment. At Barefoot Landing, just down the road, is the Alabama Theatre, the live entertainment destination voted numerous times to be the Best Live Entertainment Theatre in Myrtle Beach, with shows like their signature ONE The Show. Another popular top-notch live musical venue is the Carolina Opry, which puts on highly acclaimed shows every year. When you choose to anchor your North Myrtle Beach vacation at a Place at the Beach III, you choose the best seat in the house for every experience you can dream up! Each day you wake up in your condo to see the flaming sun and the pristine white beaches and the shimmering ocean, you will be delighted you chose to stay at A Place at the Beach III.